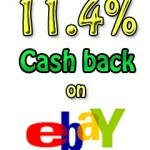 I shop on eBay and I am always searching for any way to save money on eBay purchases. To me eBay has always been a numbers game. 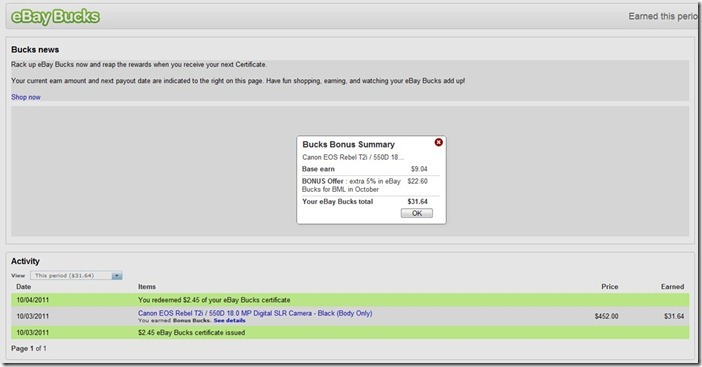 eBay introduced a program a while back called “Ebay Bucks” and my epic mission to game the system began. It works like this, you bid and win an auction. 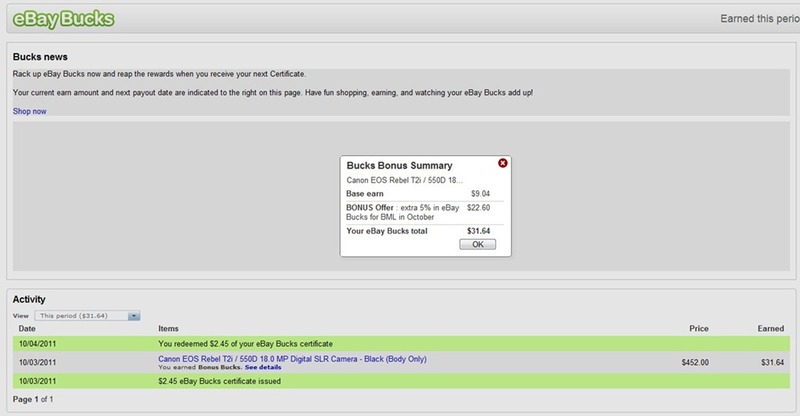 After paying for the item, eBay credits your eBay account with 2% back in “eBay Bucks.” These eBay bucks are given to you in quarterly certificates. Oh how delightful, especially for those who have made buying on ebay a business. I myself frequently buy and resell items I buy on ebay for profit. How do I sell them? Well that’s for another article, but for now you should know that I was buying up to $7,000 a month in “inventory” off ebay. So lets do the numbers, $7000 * 2% = $140 a month. Bigcrumbs.com used to be another program to get back 36% of the sellers fees as a buyer. Lets call this a conservative 2% cashback for ebay. That’s another $140 right? Well it used to be. However Ebay canned the program in mid 2011 and started exploring their own options. I mean think about it. Bigcrumbs and all of the other programs were just acting as a funnel for already current ebay buyers to get back another 2% while they took a piece. Ebay was right to make this move, although I would have loved to see Bigcrumbs stay active for ebay. Bigcrumbs is still active for many good stores like HP, Kmart.com, Jcpenney.com, Nordstroms, and Sears for example. If you are buying something online – This is FREE MONEY. So why am I mentioning this? Well when the program with Bigcrumbs ended ebay said they were exploring their own options right? Well they have had several promotions, but this month – its pretty Epic. 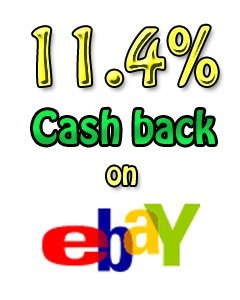 7% BACK through Ebay bucks. First off you need to subscribe to ebay bucks. Basically you log in your ebay account and click subscribe. Boom, Free money. One note I learned though, you cannot snipe auctions (bid within last few minutes) – For all the details check out the FAQ. I did say 7% right? Well get this. If during checkout of an item you purchase you select “Pay Later through Paypal” you get an additional 5% until the end of October. That is 7%. Wait a second, You said 10%! All these numbers are confusing! Well here is the additional 3%+. First off, the obvious one. Credit Card. 2% cashback. There are several ways to get 2% which I will cover in a later article, but for now lets assume you have a 2% cashback card. That’s 9%. Note you can simply pay off the Pay Later virtually immediately (have to wait for the balance to show up). Be sure to remember though. Now for final percentage. Gas Perks. Many people overlook this perk. I myself shop at Kroger (as many do), but there are many Programs. Kroger, Giant Eagle, Biggs, and plenty of local deals. Go to the grocery store and buy gift-cards. One little secret here. Most credit cards that give back 2% for gas and grocery and only 1% for other purchases will classify these cards as groceries and give you the 2%. Kroger is NOT the best program in the nation – it is actually pretty terrible, but I get .20 per gallon for $50 of giftcards. If you fill up 12 gallons at a time that is $1.20 off for $50 purchased (2.4%) back. 9% + 2.4% = 11.4% or more if you have a bigger tank. If you are a shopper at giant eagle, it would be double the perks – and would be 13.8% cashback. There are some details you need to know. First, you can only use $5000 worth of ebay giftcards per account per 6 month period. You need to have at least .01 that is put on the paypal pay it later. You cannot use giftcards completely. Therefore if your bill is $107.15 you need to use $100 of giftcards and put $7.15 on the pay it later. I made a personal purchase that I will also share with you. $464.99 –$54.43 = $410.56 — $106.43 off vs. best amazon price. I know what you are thinking, that’s a big ticket item so it looks very dramatic. You are right, but you know what would look even more dramatic? 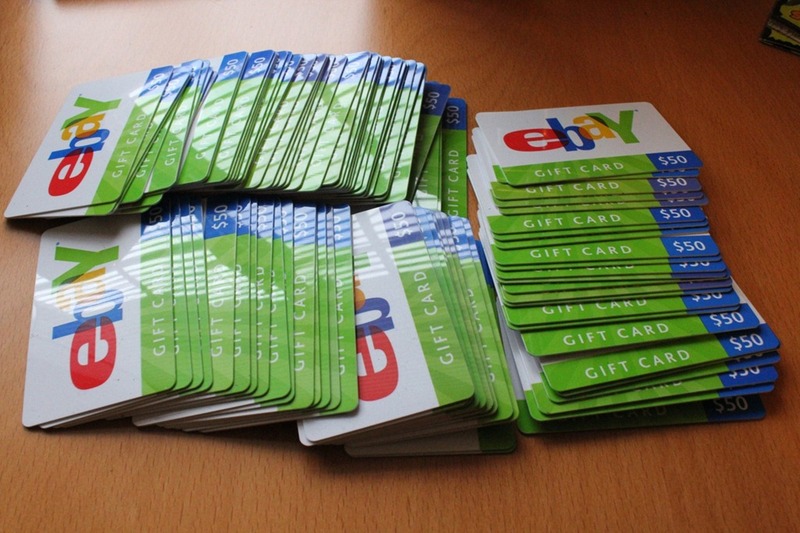 $5000 gift cards in a single transaction.. say a used car, real estate, or other high priced item.